Nikolaus Harnoncourt: I saw the Pantheon because this is so important for me, the architecture of the Pantheon and the Piazza Navona where the two great poles of Roman Baroque Bernini and Borromini, they make a boxing fight, that&apos;s on the Piazza Navona there is the monument of Bernini directly opposite the church of Borromini and this I see like “oh what can I do to show that you are nothing” and so everyone of those two says that for me and then when I hear music of Corelli or of young Handel when he performed in Rome, with Corelli as concert-master and with the table decoration made by Bernini you know that the absolute best sculptures of Bernini were eaten up. Nikolaus Harnoncourt: Yes because they were of marzipan and there were the table decorations of Cardinal Borromini and these cardinals who asked Handel to perform his first Italian oratorios. 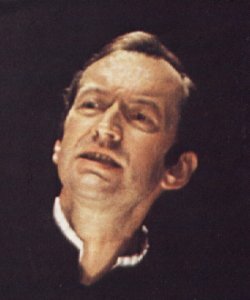 Nikolaus Harnoncourt was born in Berlin in 1929 and grew up in Austria in Graz. His father Eberhard de la Fontaine Graf d&apos;Harnoncourt-Unverzagt was an enthusiastic amateur musician and keen that his children should learn to play musical instruments. He composed sonatas and chamber music for them—he played the piano, sons René and Philipp played violin and young Niki the cello. Nikolaus Harnoncourt had many talents and was also interested in wood carving and sculpture, even creating his own marionette theatre. He realised, however, that he could never manage to make it a profitable concern and abandoned his plans from one day to the next. It was when Nikolaus Harnoncourt was ill in bed one day in autumn 1947, while he was listening to a broadcast of Wilhelm Furtwängler conducting Beethoven&apos;s Symphony No. 7, that he decided to concentrate on being a musician. In 1948 he enrolled as a cello student of Prof. Emanuel Brabec at the Vienna Academy of Music; already then at the age of 19 Nikolaus Harnoncourt had a fascination for early music. Nikolaus Harnoncourt: For me the real speciality of Vienna is the mixture of cultures. I&apos;m not Viennese, I came to Vienna when I was 18 years and to prepare for that, so I came in like a peasant and the Viennese they are not very polite to the provincials who come there. But I read books about Vienna in around 1500 when Emperor Maximilian was there. And the cardinal bishop Aenea Silvio Piccolomini, who later became Pope, he wrote about Vienna very interesting and he said “there is no Viennese who is longer there than two generations. They&apos;re all coming from Bohemia, from Hungary or even from Russia or from southern Slavian countries, Croatia today or so, lots of Italians, lots of French and the main language was either Italian or French and just very simple Viennese spoke a funny German which they called Viennese. And when we walk through the streets I can hear music out from every second window”. This he wrote in 1500 and so I thought what kind of music may he have heard then and from what instruments. Then I had my imagination. And I was very involved in the music of this time already then. And where did they walk around? There is a part of Vienna between Stephanskirche and the Donaukanal. There are some places but you cannot see how old they are because the houses 17th century, 18th century but if you scratch away you would see that they are Gothic. But still when I came there I found a little room in a flat in the Schottenhof. This is a great building, a town in the town, owned by the Benedictines and with flats for normal Viennese. And the staircase was from I think 1500 or so and when I went up the staircase I felt in my legs the rhythm of the 16th century. And when I went down there and I recognised the importance of a good staircase that the mood you get in a day is partly created by the rhythm you use when you go down the stairs of your house and when the stairs are made by a bad architect and in the 16th century there were no bad architects at all then you get a bad rhythm, you get a bad mood and your work will be bad also. And so I had a great luck in that. Elizabeth Mortimer: But what about the Josefstadt because that&apos;s quite important, the house where you founded Concentus Musicus. Nikolaus Harnoncourt: You help me a lot, we married in 1953 and we found a little flat in the Josefstadt and I think still it was the most beautiful flat in Vienna and this house was owned by the family of the bee scientist Karl von Frisch. There were four brothers and one was Karl von Frisch and those four brothers and they formed a string quartet in the time of Brahms and the widow of one of those brothers was the house lady and we lived there we had a wonderful garden and in this house a room was built just for Gottfried Keller when he was in Vienna to be there and write his things and when Marie Exner, who was the aunt of the Frisch brothers, when she married Gottfried Keller wrote a marriage poem and Brahms made from this poem a marriage music, this is not known but it exists. And so this old Marta Frisch she gave us the flat and she said, here is the place where Brahms always played when I was 18 years old and my husband played the violin very bad and Karl played cello and Brahms was an ugly little man with his squeaking high voice and he was absolutely not nice to us. But for us it was almost holy to live in a flat where Brahms was every 2 weeks playing piano and it was as if the waves of his piano playing were still there. And in this room we rehearsed 17 years with Concentus Musicus. We founded it there, we rehearsed in these rooms and I must say it was a blessing to live there. From this flat where we are now we can look from the balcony over to it and this is a great place. Elizabeth Mortimer: So the Josefstadt is a very important part and this area is really the birthplace of the Concentus Musicus. Elizabeth Mortimer: And when you were playing in that particular apartment that you&apos;ve just spoken about when you yourself were playing the cello, didn&apos;t you find that there were some spike holes in the parquet floor? This interview was broadcasted on Deutsche Welle on Dec 9, 2003. © by Elizabeth Mortimer.